Examples of French driver's licenses that will be refused by the Japanese translators: in my imagination, my license combines the worst features of all of the above. For most foreign visitors who want to drive in Japan, an international permit is sufficient. My problem seemed to be that I had a driver's license issued by France while I'm resident in Britain. If I owned a car here, I would have needed to swap it for a British one by now, but since we live in London and had no car, I didn't bother. So... can I get either the French or the British authorities to issue me an international permit? The answer is that I might be able to do either, with a bit of fiddling and judicious manipulation of addresses, but there's no need. Actually, Japan doesn't accept the international permit issued by the French authorities, because it doesn't meet some standard or other. Well done, France! I don't know if I could use an international permit issued by the British authorities (supposing I could get one) but fortunately the Japanese, keen to rent their rental cars to any paying customers, have come up with a work-around: the Japanese Automobile Federation will produce official translations of our French licenses, for a small fee, and these are acceptable. Actually, given that it's one translation for all of France and that all the 'translators' have to do is fill in our personal details, the fee is maybe not so small, but that's how it goes (try being international, you'll see). The other little snag is that the Japanese Automobile Federation will only post translations to addresses in Japan. Alternatively, you can get your license translated on the spot, when you arrive in Japan. For some people this is probably a good, economical solution, but for me, it means blowing a full day of the trip on administration, with a teenager in tow. Fortunately, there is another workaround. You scan your license, send it to a Franco-Japanese agency (Vivre Le Japon) and they deal with submitting it, receiving it at their offices in Japan and sending it on to you. For a small fee. They'll also handle the car rentals themselves, for a mark-up which is very reasonable (I checked), and also avoids the awkward assumption apparently made by Japanese rental car agencies that all their clients have phone numbers which work in Japan. 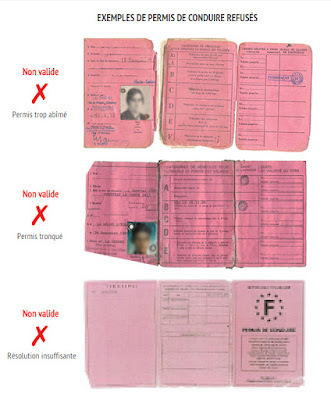 So now, there is only one snag left: the state of my French driver's license. I must say, what with our other countries falling over themselves to pile shame and disgrace upon our heads, it's actually nice to be able to offer a criticism of France. France! That candy-pink cardboard chose that's supposed to last us a lifetime... mais c'est n'importe quoi, ce torchon, dites donc!!! Obviously, it's falling apart, what with being 20 years old!!! Anyway, this morning was dedicated to making the best possible scan of my slowly disintegrating French driver's license and sending it off to Vivre le Japon, along with a request for a car for four days in Aomori Prefecture and two days at Nikko in Tochigi Prefecture. I think it will work. I hope it will.